Hello friends, hope you all are enjoying good health and having good time. 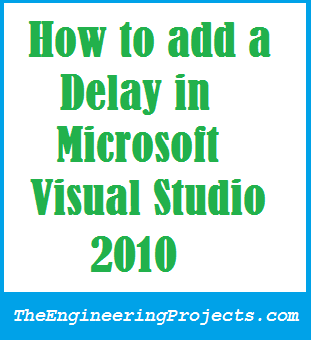 Today’s tutorial is not too big and is simple about how to add a delay in visual studio 2010. Before starting this tutorial, let me first tell you that I got an excellent feedback about the last tutorial on How To Use Proteus ISIS & ARES & also got few queries and suggestions. One of them was to post a similar tutorial on the Eagle software as well which I will hopefully start in the coming week. The engineers who had worked on Microcontrollers like Arduino or PIC Microcontroller or 8051 Microcontroller, then they know that what is a delay. A delay in programming is a statement which adds a pause in your code. For example, in some project you want to turn on two lights one after another with a delay of like 5 sec so now what will you do. You will first turn the first light on and then add a delay of 5 sec and then turn the second light on. That delay just let your code wait for 5 sec and then execute the next line. So, now we have an idea what is a delay so lets have a look at how can we add this delay in visual studio 2010. This command will generate a delay of 1sec. You can change this value in order to change the time of delay. i.e. 500 for 0.5 sec delay. 2000 for 2 sec delay. 5000 for 5 sec delay. You need to calculate this value for your required delay and add it here. You should take much care in using this delay because this delay simply makes your software to sleep and thus while the delay is in process, your software won’t do any other task.